It was in October 2006 that Hometime, the nationally syndicated home improvement show, returned to help and film major restoration work of Betsy’s house, Maud Hart Lovelace’s childhood home. Hometime had worked and filmed some of the exterior work on the house in 2005. During the 2006 restoration, the interior of the house was gutted to the studs, revealing many interesting clues as to the original construction of the house. But also found between the attic floor and the main floor ceiling were many interesting artifacts including high buttoned shoes, long black stockings, a shirtwaist, a valentine, a card tally, puzzle pieces, Lincoln Logs, checkers, porcelain doll arm, magazines and newspapers. These artifacts may have belonged to the Hart family when they lived in the house so many years ago, or they may have belonged to any of the people who lived in the house after the Harts’ moved to 5th Street. But the real treasure found beneath the attic floor was a yellowed and faded letter. 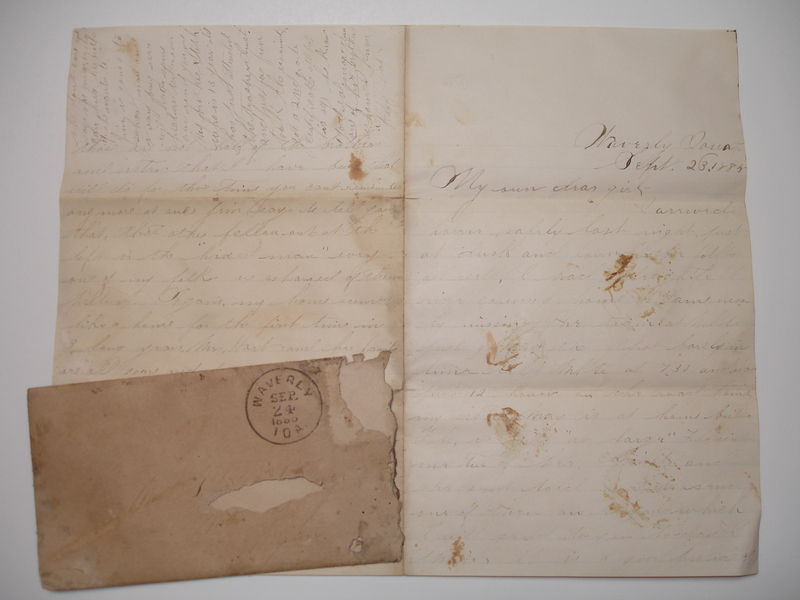 The envelope, addressed to Miss Stella Palmer, is postmarked September 24, 1885. Inside revealed a letter from Thomas Hart (Maud’s father) to Stella Palmer (Maud’s mother) written two years before they would marry. They were married on October 15, 1887 on the shores of Madison Lake. The letter is transcribed exactly as written complete with misspellings and punctuation. A blank is inserted for illegible handwriting.